If you haven’t used or heard of KMC chains, KMC specializes in making some of the best and most reliable chains on the market around the world. 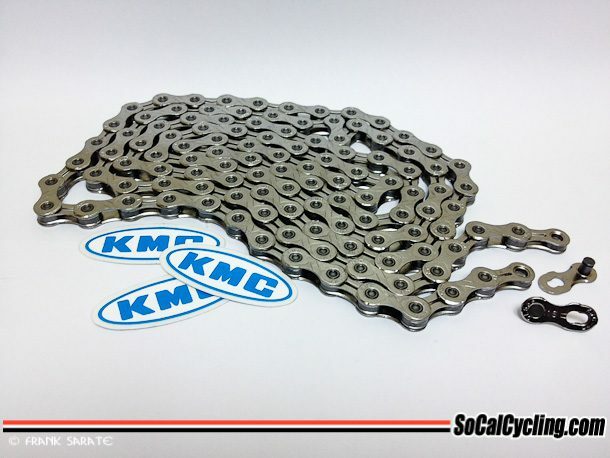 No matter if you are riding BMX, mountain bike, track, fixie or road, KMC makes a variety chains for each type of bike, for various speeds and in different chain weights. The SoCalCycling.com Team has been using KMC chains for the last 9 years. This year our Team bikes are equipped with the KMC X11L Silver chain. KMC chains offer the best value and durability on the market for consumers. Coming in at 258 grams the X11L Silver chain is very light and very durable. The KMC X11L Silver chain is not only light and durable, but works incredibly smooth and shifts flawlessly with our FSA and Shimano drive train. The chain has good rigidity to allow for a snappy feel when shifting and putting out the power when pushing hard on the pedals. One of the best features of the KMC chains is the MissingLink connector. The MissingLink connector is very durable and makes it easy to install and uninstall a chain for maintenance. It’s a pleasure to use the MissingLink connector without having to install unreliable pins, that if not installed properly can lead to a catastrophic failure like some of the other chains on the market. In addition, KMC is able to drop the weight of the chain by using hollowed out plates to reduce its weight without sacrificing strength or durability. If you are looking for an aftermarket chain or to replace an old and overused chain, then KMC has the right chain for you! For more information on the KMC X11L Silver chain and KMC chains, visit kmcchain.us to find a dealer near.